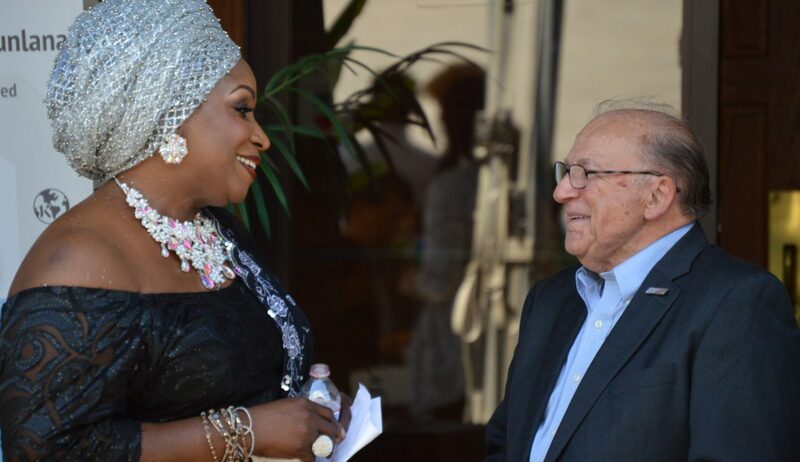 Princess Moradeun Ogunlana speaks with Bio-Tech Pharmacal, Inc. owner and president Dale Benedict at the partnership launch event on August 10, 2018. Ogunlana is a 1991 graduate from the University of Arkansas Little Rock and will serve as a licenced distributor for Bio-Tech's products in Africa. Bio-Tech Pharmacal of Fayetteville has launched a new partnership with Princess Dr. Moradeun Ogunlana, CEO of Innovative Global Consulting and the African Women’s Health Project International, who will serve as the official Bio-Tech representative for Africa. Ogunlana will begin licensed distribution of Bio-Tech’s vitamins and dietary supplements in Nigeria this year. The partnership was made possible through efforts by Denise Thomas, director of Africa and Middle East Trade for the World Trade Center Arkansas, who connected Ogunlana with representatives from the company. Ogunlana, who is a member of Yoruba Royalty in Nigeria, is also a 1991 graduate of the University of Arkansas at Little Rock and holds a degree in journalism, a Masters of Public Health from Southern California University of Health Sciences and a Ph.D. in Humanistic Studies from CICA International University. According to Ogunlana, Vitamin D deficiency is associated with high maternal and fetal mortality rates, poor pregnancy outcomes, breast cancer and many other diseases including osteoporosis, rickets, heart disease, depression and upper respiratory tract infections. The partnership launch was celebrated with an event on August 10 at Bio-Tech Pharmacal’s facility in Fayetteville. Ogunlana also celebrated the launch of her new book, The Achiever’s Power, at the event. Officials and dignitaries attending the event included Fayetteville Mayor Lioneld Jordan, World Trade Center President and CEO Dan Hendrix, Consulate General of Nigeria in Atlanta Kayode Laro, NWA District Representative for the Office of the Governor Stephanie Blevins and His Royal Highness Oba King Aderemi Adedapo of Osun State, Nigeria. This partnership is the beginning of a long-term effort to improve the quality and access to healthcare in Nigeria. Ogunlana says the long-term goal of the African Women’s Health Project International is to build a first-class hospital and Wellness Center in Nigeria, and plans are already in the works to make this dream a reality. For more information about Bio-Tech Pharmacal, visit biotechpharmacal.com. To learn more about the African Women’s Health Project International, visit awhpi.org.